^ Malaya Celebrates, 1959. British Pathé. [2 August 2013]. （原始内容存档于2013年9月7日）. ^ 2.0 2.1 Laporan Kiraan Permulaan 2010. Jabatan Perangkaan Malaysia: 27. [2011-01-24]. （原始内容存档于2010年12月27日）. ^ KL on track to megacity status. Focus Malaysia. [30 April 2015]. （原始内容存档于2014年12月19日）. ^ Malaysia Elevation Map (Elevation of Kuala Lumpur). Flood Map : Water Level Elevation Map. [22 August 2015]. （原始内容存档于22 August 2015）. ^ 6.0 6.1 Malaysia: largest cities and towns and statistics of their population. [2013-03-13]. （原始内容存档于2012-12-16）. ^ Kearney, Inc., AT. The 2010 Global Cities Index. Foreign Policy. （原始内容.archive.org/web/20110302042007/http://www.foreignpolicy.com/node/373401 存档 请检查|url=值 (帮助)于2011-03-02）. ^ Print! Email! Author: 2thinknow. -index-2016-2017-top-100-cities/9779 Innovation Cities Top 100 Index 2016-2017: City Rankings » Innovation Cities Program & Index: City Innovation for USA, Canada, Australia/NZ, Europe, Asia, Latin America, Mid-East 请检查|url=值 (帮助). Innovation-cities.com. 9 May 2018 [9 May 2018]. （原始内容存档于2012年1月19日）. ^ Kuala Lumpur Population 2017. World Population Review. （原始内容.archive.org/web/20170407054708/http://worldpopulationreview.com/world-cities/kuala-lumpur-population/ 存档 请检查|url=值 (帮助)于2017-04-07）. ^ Territorial extent. 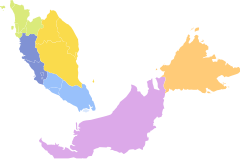 States of Malaysia. statoids.com. [2007-12-11]. （原始内容存档于2010-06-14）. ^ Top 100 City Destinations Ranking: WTM London 2017 Edition. euromonitor.com. [2018年7月5日]. （-2017.html 原始内容 请检查|url=值 (帮助)存档于2016年11月30日）. ^ Kuala Lumpur History. All Malaysia. [2009-09-15]. （原始内容存档于2009-10-18）. ^ 16.0 16.1 From tin town to tower city. kiat.net. [2010-09-28]. （原始内容存档于2010-07-27）. ^ Kuala Lumpur History. Kuala-Lumpur.ws. [2010-09-28]. （原始内容存档于2010-09-29）. ^ Sejarah Malaysia. Sejarah Malaysia. [2007-12-15]. （原始内容存档于2002-09-02）. ^ Kuala Lumpur. Encyclopædia Britannica. [2007-12-06]. （原始内容存档于2007-12-26）. ^ Kuala Lumpur: Growing Pains. Asia's Best Cities 2000 (Asiaweek). [2007-12-04]. （原始内容存档于2007-12-03）. ^ Kuala Lumpur Location. Malaysia Travel. [2010-09-18]. （原始内容存档于2010-09-18）. ^ Extreme Temperatures Around the World. Maximiliano Herrera. [2010-09-18]. （原始内容存档于2014-08-06）. ^ Weather in KL. Welcome-KL. [2012-07-10]. （原始内容存档于2013-02-09）. ^ Kuala Lumpur Environment. Kuala Lumpur City Hall. [2007-12-12]. （原始内容存档于2007-12-13）. ^ Hazardous haze shrouds Kuala Lumpur. MSNBC. 11 August 2005 [2007-12-13]. （原始内容存档于2007年12月14日）. ^ 28.0 28.1 DBKL History. Kuala Lumpur City Hall. [29 April 2015]. （原始内容存档于29 April 2015）. ^ Malaysia's towns and cities are governed by appointed mayors. City Mayors. 2006 [9 October 2006]. （原始内容存档于2011年2月23日）. ^ Ezani, Emizul. Organisation Chart. www.dbkl.gov.my. （原始内容存档于2016-07-27）. ^ 32.0 32.1 Azlan. Headline: Percentage usage of public transport to be increased to 40 percent. Radio Televisyen Malaysia. 13 October 2006 [22 October 2006]. （原始内容存档于30 September 2007）. ^ Malaysia Airlines Takes Flight to MEGACITIES on National Geographic Channel (新闻稿). National Geographic. [19 December 2007]. （原始内容存档于6 February 2008）. ^ KLIA Ekspres. Express Rail Link Sdn Bhd. [13 December 2007]. （原始内容存档于8 December 2007）. ^ Subang only for turbo-props. Asian News Desk. 27 November 2007 [13 December 2007]. （原始内容存档于2007年12月18日）. ^ 37.0 37.1 37.2 37.3 KL’s Sister Cities. Poskod Malaysia. [2013-05-20]. （原始内容存档于2013-08-30）. ^ US twin city for Subang Jaya?. The Star. [2013-05-20]. （原始内容存档于2009-02-22）. ^ Chennai, Kuala Lumpur sign sister city pact. The Hindu (Chennai, India). 2010-11-26 [2010-11-26]. （原始内容存档于2010-11-29）. ^ Kumar Das, Arun. Delhi to London, it’s a sister act. The Times of India. 2002-07-07 [2008-08-30]. （原始内容存档于2008-12-07）. ^ Sisterhoods. Isfahan Islamic Council. 2005 [2007-12-04]. （原始内容存档于2007年10月12日）. ^ 42.0 42.1 42.2 42.3 42.4 About Members: Kuala Lumpur. Asian-Pacific City Summit. [2007-11-03]. （原始内容存档于2009-03-28）. ^ Mashad-Kuala Lumpur Become Sister cities. FARS News Agency. 2006-10-14 [2007-12-04]. （原始内容存档于2011-07-14）. ^ ビジネスパートナー都市 (BPC). Osaka City Government. 2009-12-28 [2010-09-23]. （原始内容存档于2013-01-20） （日语）. ^ Kardeş Kentleri Listesi ve 5 Mayıs Avrupa Günü Kutlaması. Ankara Büyükşehir Belediyesi. [2010-09-30]. （原始内容存档于2009-01-14） （土耳其语）.